The prohibition applies to Astra Agro’s own plantations as well as to those of its suppliers, according to a statement posted yesterday to the company’s website. Astra Agro characterized the freeze as a “major step” toward bringing its operations into line with the standards of the Indonesia Palm Oil Pledge (IPOP), a high-profile, joint sustainability commitment signed by fellow industry titans Wilmar, Cargill, Golden Agri-Resources (GAR), Asian Agri and Musim Mas as well as the Indonesian Chamber of Commerce (Kadin). The IPOP bans clearing of forests and peatlands, which is still legal under Indonesian law. The companies have also made their own commitments, but the IPOP teams them up with Kadin and obligates them all to lobby to the government to make the law as strong as the pledge. Astra Agro is one of the biggest companies not to announce a no-deforestation policy, but yesterday it said it was now in the process of formulating one. “AAL welcomes the IPOP initiative and is in the process of carrying out a detailed assessment of its practices necessary to develop the required policy to meet the required obligations, which we are aiming to complete as soon as possible,” Astra Agro Director Joko Supriyono said in the statement. 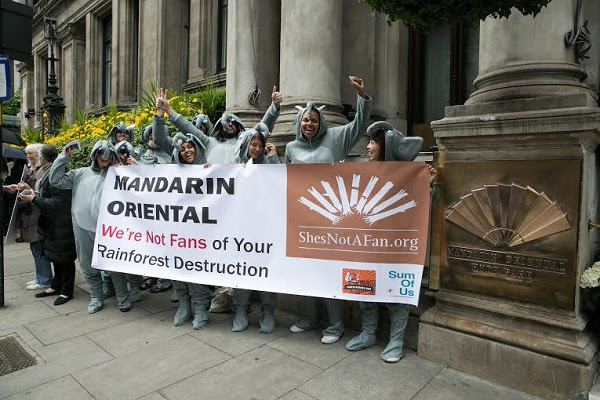 Forest Heroes, the group that spearheaded the She’s Not a Fan campaign against Mandarin – the title is a play off the hotel chain’s celebrity-fan endorsement drive – welcomed the announcement. Forest Heroes also urged Joko, who is also head of the Indonesian Palm Oil Producers Association (GAPKI), to join Kadin in calling for government reforms. Joko has previously taken the position that linking oil palm expansion to Indonesia’s sky-high deforestation rate is “irrelevant” and portrayed forest campaigners as agents of the Western soybean oil and rapeseed industries, which he says are threatened by the rise of Indonesian palm oil. “It’s time for GAPKI to become a force for conservation and responsible development, rather than fighting to maintain the old status quo,” Forest Heroes chairman Glenn Hurowitz said. Both Mandarin and Astra Agro are ultimately owned by Jardine Matheson, one of the 200 largest publicy traded companies in the world and controlled by the Scottish Keswick family. No Comments to "Palm Oil Giant Announces Deforestation Freeze Amid NGO Campaign"